A while back I received a call from another aquatic therapist. A seven-year-old boy with Autism Spectrum Disorder (ASD) fled from his home. His house was usually bolted to keep him from escaping, but on that day, before anyone could stop him, he took off. His mother was terrified. She immediately called the police and began driving around looking for him. Somehow, he got himself to the city’s swimming pool, walked through the front door, through the lobby, through the locker room and into the pool area. Without hesitation he walked right into the pool. 911 was called, and the police realized this child fully dressed at the bottom of the pool was the same one who ran away from home shortly before. Simultaneously, I began working with another boy, age 5, and also with ASD who was so terrified of water he had never taken a bath or showered. His mom would wipe him down with a damp washcloth, and even that was a huge battle. They came to me hoping that I could alleviate his fear of the water so that he could take a bath at home. This boy believed that even a wet toe or finger would result in his immediate death, and was truly terrified. Both boys respond to their overwhelming irrational fears in different ways, and neither are “water safe”. One is craving the quiet isolation of being underwater so much that he would not know to come up for air or swim to the side for safety, the other is so fearful of water that his basic hygiene and well-being is compromised. Children with Autism Spectrum Disorders see their world in a very different way. Often, their sensory world can be very unpredictable and overwhelming. The filtering mechanism in their brains often works in a different way in assimilating the senses such as touch, smell, hearing, taste and sight. According to the National Autism Association, accidental drowning accounted for approximately 90 percent of total U.S. deaths reported in children with autism ages 14 and younger subsequent to wandering/elopement in 2009 to 2011. Furthermore, research indicates that nearly 50 percent of children with autism attempt to escape from a safe environment – a rate nearly four times higher than children without autism. 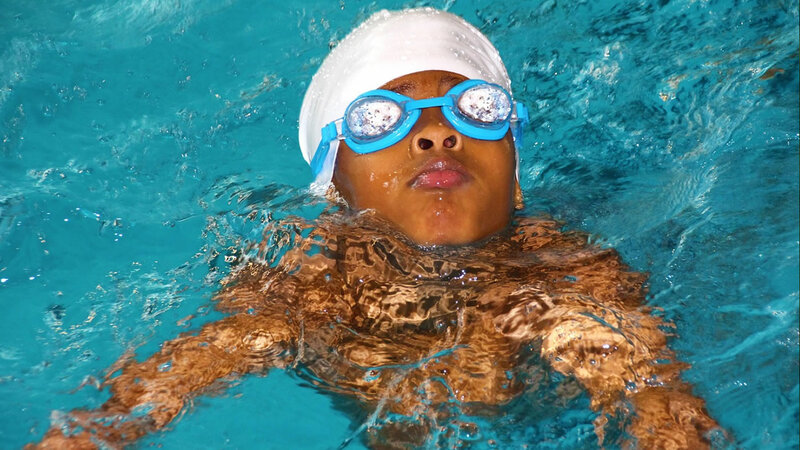 Learning basic swimming skills is imperative. Learning to overcome their fears and anxiety is crucial. Adaptive swim lessons for kids with ASD is critical. Not only in learning basic safety skills, but in easing their “fight or flight” response that so tightly correlates to the water. The boy who walked into the pool now can wait at the edge and knows to come in only with permission. He also knows how to get up to the surface, swim to the side and climb out safely. The other boy, who was terrified of water was slowly and methodically introduced. With time, he also has learned to enter the pool independently, kick his feet and float on his back with his ears in the water. HUGE accomplishments for both, and anxiety greatly subsided. Overcoming one challenge at a time, one day at a time is all it takes.